This page covers the small print you might need in connection with your order. It covers our terms and conditions, a privacy statement, the level of security we employ, how you can obtain a refund and a disclaimer concerning the use of information on this site. Drug-Aware.com is a website owned and operated by Living For Longer Ltd (Registered Office: Unit 1A Townfoot Industrial Estate, Cumbria, CA8 1SW. Registration No. 09528040), which has been providing drug and alcohol test kits, training, laboratory services and consultancy to the National Health Service (NHS), the British Police, private healthcare organisations and companies across the UK since 2001. We operate our website as an extension to this service, so that we may provide useful information, articles and technical support. Consequently, you should feel free to make full use of the Drug-Aware website for information, along with the ability to purchase test kits online. We hope you enjoy the site and find all the answers you are looking for. This site has been designed to be as informative and helpful as possible, but it is not a substitute for sound medical advice from your Doctor. Whilst we have made every effort to ensure that all information on this web site is current and accurate, we cannot be held responsible for any losses, damages, costs and other consequences resulting directly or indirectly from using this site and any information or material available from it. To the maximum extent permitted by law, Drug-Aware.com and Living For Longer Ltd exclude all liability to any person arising directly or indirectly from using this site and any information or material available from it. We also link to a number of external websites, but we cannot be held responsible for any of the content found there, as we have no editorial control over them and changes can be made to them after we have reviewed them for linking. This site is provided free of charge as an addition to the product literature included with your order. Please ensure that you read all of the information provided with the products before using any test kit that you have purchased from us. The sale, modification or reproduction of any information obtained from this web site (and products purchased from us) is strictly prohibited without prior permission in writing from Drug-Aware.com or Living For Longer Ltd.
Our materials are protected by Copyscape – a service which scans the internet for infringement of our intellectual property. This ensures that all infringements are brought to our attention immediately. These terms do not affect your statutory rights. As with any purchase online, we fully appreciate that ordering an item based solely on what you see and read on a website can be difficult. Consequently we operate a sympathetic returns policy and are more than happy to answer any questions you may have. Visit our Contact Us / FAQ page to find the answers to the most common questions, but if you do not find the answer you are looking for and require additional information, please contact us using the link at the top of this page and we will try to help you. Buying products online from Drug-Aware.com is quick and easy. Simply browse the appropriate pages of our site and add any items that you wish to buy to the shopping cart by clicking the “Add to Cart” buttons. When you have found everything you are looking for, click on any “Checkout” button on the site and you will be taken to the page where you may complete the transaction. Purchases made using a credit or debit card are processed immediately, but we also accept UK cheques (made payable to Living For Longer Ltd), postal orders and money orders. Please be advised however, that a £15 charge will made for any returned cheques to cover our bank charges and administration expenses. To cover us legally, we must point out that when you are sent a confirmation of order by email, it is to inform you that your order has been received by us. This does not automatically indicate that a contract exists between us. However, as soon as your order is approved and processed we will email you to confirm that a contract has been formed and honoured. This term covers us both in the event that an error has been made in pricing on the web site or within the shopping cart software. It is also important in the unlikely event of our no longer being able to supply a particular product for a reason beyond our control. But don’t worry, if there is ever any change in price or availability of a particular item, we would always contact you to ensure that the change is acceptable. 20% VAT is already included within the price for all orders made from within UK or the European Union. With the sensitive nature of testing for drugs and alcohol we fully appreciate the need for keeping our relationship private. As such, we are totally committed to protecting your privacy. All information collected about you (necessary in order to supply your goods) will be handled in accordance with the Data Protection Act 1998. We will NEVER pass your details on to anyone else. The information we will hold within our electronic records includes your name, address, telephone number (if provided), email address, and order details. WorldPay or PayPal (depending on which payment processor used) hold your card / transaction information and we are never provided this. We endeavour to ensure that the information we hold about you is accurate and current. Consequently, you may email us to ask what data we hold on you at any time (you will be asked a security question in order to release the information). This data may then be updated or deleted as appropriate. In terms of the privacy of your order, we ensure that all orders are shipped in plain packaging with no hint of package contents. We mark all packages as “Private and Confidential” (unless you specify otherwise in the “comments / instructions” box at checkout). A plain return address with no company name will also appear on a small label on the reverse of the package to comply with Royal Mail requirements. We also track statistics on visits to our web site. This information is anonymous, and is based upon user behaviour in order to improve visitor experience. In the event that you receive a package that is incorrect, damaged or that you no longer need, we will gladly provide you with a full refund or send a replacement. Should you wish to send back unwanted goods please contact us by email or telephone for full instructions and a product return code. You have 7 days from the date you received the goods in which to return them to us for a refund. Refunds are issued from WorldPay or PayPal (depending on the payment processor used) within 30 days of cancellation. Unfortunately, due to the nature of the products we supply, returned items must arrive in the same condition as when we sent them – i.e. unused, in original packaging and complete with all of the documentation / literature we provided with them. Please note: used or opened testing kits or any used goods can not be returned. It is illegal to send any goods contaminated with human bodily fluids through the mail. Please ensure when contacting us that you clearly state the reason why you would like a return or a replacement. We will issue your product return code promptly and ask that you send the package back to us within 7 days of receiving your order. Technical support is carried out by email. (Other information required by the Department of Trade and Industry Regulations for ecommerce businesses: Registered Office: Unit 1A Townfoot Industrial Estate, Cumbria, CA8 1SW. Registration No. 09528040). We are not liable for items that are lost by Royal Mail – If in any doubt please choose the “signed for” or “Tracked” delivery option. Proof of sending is provided for lost items. If only part of your order is available, we shall inform you. This is unusual, as we carry ample stock levels. In the rare event of stock shortages, we have a policy of part-ordering all customers to ensure that everyone receives some product to be using whilst they await the completion of their order. Part or split orders are shipped at our expense. For millions of people around the world – including our customers – WorldPay is the way to pay – they are trusted and secure. An important part of The Royal Bank of Scotland Group, the 5th biggest banking group in the world, WorldPay payment solutions are trusted by thousands of businesses, big and small. Our customers are able to make payments over the internet, by phone, fax and mail. 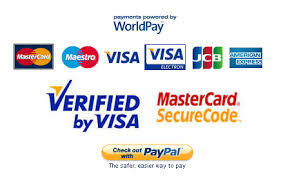 Via WorldPay, we accept Visa, MasterCard, Diners, American Express, JCB and all the major credit cards. Not forgetting debit cards and local payment schemes like Maestro, Laser, Electron and more. The WorldPay payment system uses a combination of both established and innovative techniques to ensure the security and integrity of all sensitive data. Furthermore, their public web servers are certified by Thawte, a public Certificate Authority, ensuring that both the shopper and retailer can have confidence that nobody can impersonate WorldPay to obtain confidential information. The transfer of the purchase details from the our site and shopping cart to WorldPay is encapsulated using an encrypted and digitally-signed protocol. This uses a combination of standard methods such as PGP, RSA and MD5 to ensure that the information passed is secure and tamper-proof via SSL. Any communication between the shopper and WorldPay is also encrypted to the maximum strength supported by the shopper’s browser using 128 Bit SSL. Shoppers are also protected from fraudulent use of their card in a “card not present” environment, by their card issuers. The card issuers provide the right for shopper to dispute a transaction if the goods/services did not arrive or if the card was used fraudulently. Data storage on WorldPay systems, and the communication between WorldPay and the worldwide banking networks, is regularly audited by the banking authorities to ensure a secure transaction environment. They also ensure that they stay up-to-date with the latest versions of any third-party code they use, and continually review their own proprietary code.